BistroMD is one site in a growing trend for healthy pre-made home delivered meals. The foods are designed by a chef, prepared, and ready for you to eat, with more than 150 meal choices. The site also offers menus for diabetics, gluten intolerance and menopause. Although Bistro MD has a guarantee that it will provide “each member with access to the tools and support” needed to improve your metabolism, through delivery of great tasting meals, there aren’t really any online tools to take advantage of. We assume, then, the tools are the food, and the various food options available, rather than calculators and diaries. At the time of our review, BitroMD.com offered a $99 first week trial. This is a bit peculiar because it’s $99 for 5 or 7 days’ worth of food (who is going to choose 5?!). You’re also charged delivery for this period. Not only that, but the price drops after the first week, so it’s hardly an offer at all. If anything, you’re being charged more for week 1. The problem is that they’re running two concurrent offers, so the regular price has been slashed too. Talking of the regular price, if you pay full whack for the diet plans, it will be really quite expensive. The sales offer makes it more affordable, but it’s still not massively cheap. Still, the food does look really good. They offer real meals, not just dried cereal bars and fruit. If you’re looking for any sort of exercise tips, videos or workout regimes, you won’t find them here. In fact you won’t find much other than menu options and a checkout. The site could really benefit from providing more information about the various diets and foods it has available. It could even talk more about the chef, or offer diet diaries, maybe even a few calculators to help you check that you’re on target. But no, nothing. 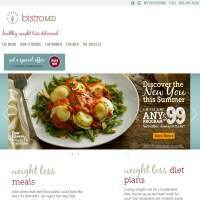 Consequently, BistroMD feels a bit more like a sales portal than a healthy eating and weight loss website. Sure, the food on offer looks good and might do a decent job at helping you to slim down, but there’s not really much else to it. It feels like being rushed through a restaurant; they’re just not taking the time to make sure you’re filled in with all the details. If you like the look of the food on offer and have the money to spend on delivered meals, BistroMD.com is a viable option. The male and female meal options are an interesting idea, too. However, if you’re looking for more than that, you may wish to look somewhere else.